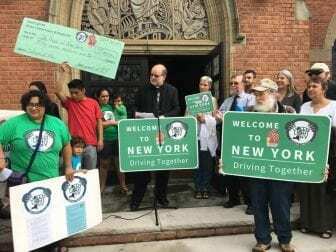 SYRACUSE, NY (WRVO) – As the New York State Fair gets underway, immigration rights advocates are calling attention to the need for undocumented farm workers to be able to drive. Undocumented workers are currently barred from obtaining a driver’s license. Victor Hernandez, a dairy farm worker in upstate New York, said when he got into accidents while on the job, the owner of the farm, his boss, never took him to a hospital. He said if he had access to a driver’s license, he could have gone to the hospital immediately instead of waiting three days later and paying someone to take him. Hernandez called it an injustice. Undocumented immigrants in New York used to be able to apply for a driver’s license but that ended after the 9/11 terrorist attacks. In 2007, Gov. Elliott Spitzer approved allowing it again, but reversed the decision soon after because of pressure. Now, supporters of the Green Light campaign want Gov. Andrew Cuomo to sign an executive order. While there is legislation in the Assembly, it did not come up for a vote yet this year. Rebecca Fuentes with the Workers’ Center of Central New York said two months ago, a family in Camillus were detained and the father arrested for driving without a license. Rachel May, who is running in the Democratic primary against state Sen. Dave Valesky, said it is an incredible hardship for those who are undocumented. She recalled visiting dairy farms in central New York a few years ago and meeting with workers. Advocates also called on Syracuse Mayor Ben Walsh for his support. The Walsh administration said they are reviewing the proposal.